One of the first sounds you may be greeted with upon your arrival at the entrance of a house/building will be the familiar chimes of a doorbell. Doorbells have assisted people with making their presence known for many years and have also served as basic security system tools. Not much is known about the origins of the doorbell, however early doorbell designs involved basic manual concepts such as simply knocking on a door to create a noise to notify someone of your arrival. This concept later evolved to more elegant designs where metal handles were placed against the outside of doors allowing guests to use the handle to knock on the door rather than their fists. This concept became very popular during the medieval ages. Other manual concepts included a bell that would be placed near the entrance of a building for a guest to ring and notify those within the building of their arrival. The major downside of this concept was that theft of these bells was relatively easy. Improvisations were made to reduce the incidence of theft, and bells were placed in difficult to reach places or even inside the building itself and were only accessible by a hanging rope making them more difficult to steal. Other early manual doorbells included hanging a bell behind a door which would cause the bell to ring once the door was opened. 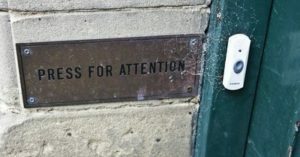 This served to notify people when doors were opened. These types of doorbells were often used in shops and are still used by some people today who wish to create a more traditional atmosphere. Early doorbell designs such as these were simplistic and did not see much change for many years. The major change came about in 1831 when Joseph Henry invented the first electrical based doorbell. However, these electrically based doorbells only became popular much later in 1913 when the invention of electrical transformers eliminated the need for expensive battery energy sources. Doorbells could now be connected to the household electrical systems making them cheaper and easier to maintain. The sound produced by early electric doorbells were mostly loud buzzing sounds which many found unpleasant. As a result, in the 1930’s electric doorbells with more pleasant chimes became popular. These chimes could include various musical notes and tones to help make the doorbells sound more appealing to users. This concept fell out of use during WWII in favour of more practical designs but later re surged in popularity again in the 1950’s. Wireless doorbell technology was the next evolution that allowed doorbells to make use of radio signals to activate the doorbell system. This enabled much easier installation processes and improved the accessibility of doorbell systems. These doorbell systems are still widely used today by many people across the globe. One of the major additions to doorbell technology within the 21st century is the customisation options available to owners. In the past, a single doorbell would be limited to one chime or tune and if people wished to hear a different sound they would then need to replace their alarm bell. Many doorbell systems today offer audio customisation options allowing homeowners to change the musical chime of their doorbell whenever they like. Some doorbells even give users the option of adding their own custom audio to the mix. As a result, people no longer need to replace their doorbells should they require a tone change. Advancements in surveillance technology have enabled new security features for doorbell users within the modern age. One of these features includes video footage that can be supplied by cameras such as CCTV’s that are connected to the doorbell system and allow people inside the home to see who is at the door more easily than before. This video footage can be streamed to their televisions or dedicated doorbell control panels. Smart doorbell technology of today provides users with more insight and control over their doorbell systems. With these smart doorbells, homeowners can be remotely notified via their phones and other smart devices of their doorbell activation even when they are not home. Using smart doorbell systems, people can even remotely access video footage provided by their doorbell systems. Additionally, smart lock technology allows them to remotely open and close their doors from their smartphones meaning they can give access to trusted guests, repairmen or friends from a remote location when needed. People have been greeted by doorbells upon arrival at their destinations for hundreds of years. The familiar, welcoming “ding-dong” sound that we are all so used to today has seen many changes throughout history and will continue welcoming visitors and guests for many years to come.